Hobarrow Bay is a cove around the corner from Kimmerdige Bay and one of my favourite locations on the Jurassic Coast. Access to it is restricted to weekends as it is on MOD land and low tides as it is very easy to get cut off, so far I’ve managed to avoid that happening although it has come close a few times! So with such restrictions I always pray for a good sky when I can get to the loctaion…tonight was a cracker!! ~ by David Baker on 17 October, 2010. I’m a sucker for colour and this has the full spectrum. 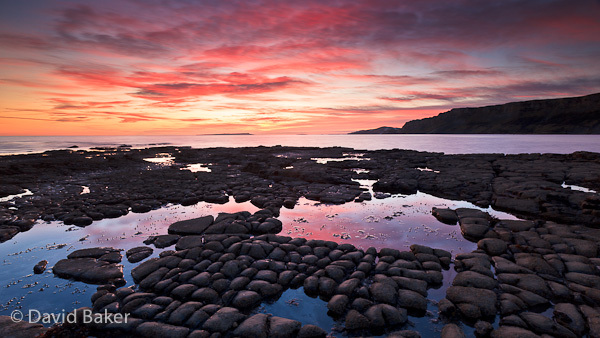 The rocks in the foreground add a lot of interest as well as reflecting some of the sunset colours.